This is the third article in this series on Russian imperial stouts. Russian imperial stouts are big, dark beers. They are among the most intensely flavored beers brewed. When it comes to their grain bill, the Beer Judge Certification Program (BJCP) has this to say. “May have a complex grain bill using virtually any variety of malt.” Let’s see if we can narrow that down a bit, starting with the dark grains. Russian imperial stouts may be dark brown to black, and the color of their foam may vary from off-white to reddish brown. They frequently have intensely roasted aromas and plenty of roast flavor and bitterness. As such, the dark grains play a central role in the character of this beer. The most common dark grains found in a Russian imperial stout are black malt, roasted barley, and chocolate malt, but there are other choices worth exploring. Black malt, sometimes called black patent malt, is a dark malt around 500 °L. It is the primary dark malt in many porters, especially robust porters. It is also common in American stouts. For example, if you’ve had Sierra Nevada Stout, you know the flavor of black malt. Roasted barley is similar in color to black malt, usually around 500 °L, but is made from unmalted barley. The coffee-like aroma of a Guinness draft stout is from roasted barley. Although its roasting profile is similar to that of black malt, there are important differences between black malt and roasted barley. Roasted barley contributes a lot of aroma to a beer, whereas black malt contributes very little. In addition, a dark beer that has roasted barley as the only dark grain will have cream-colored to light tan foam. A similar beer that has black malt as the only dark grain will have darker, reddish-tan foam. And although they are both highly roasted, their flavors are not identical. There are also lighter versions of roasted barley, often around 300°L. 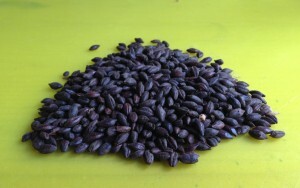 In general, however, most brewers equate roasted barley with the dark, “stout” versions. One way to discover the flavor differences between these two grains is to make a “tea” from each of them and smell and taste it. Put equal amounts of the two grains into small glasses and pour equal amounts of hot water on top of them. After a couple minutes, taste the two teas side-by-side. Black malt is sometimes maligned based on inaccurate descriptions in old homebrewing texts. Back in the 1990s, it was common to see black malt described as lending acrid or burnt flavors to beers. Often, this was accompanied by warning to only use black malt in very small amounts. 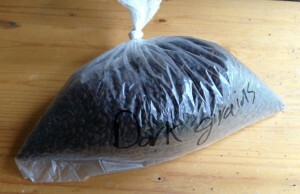 In reality, black malt tastes highly roasted, but this is a separate flavor from burnt. Acrid is a matter of opinion. However, black malt does not combust in the kiln (although it comes close), and so it can’t have any true burnt flavors. And, you can use it in the same proportions as you would any other dark grain. If you frequently brew dark beers, learning the actual flavor of black malt will help you immensely in formulating your recipes. Chocolate malt is a malt typically roasted to 350 to 400 °L, with some maltsters producing even darker versions. Many maltsters make chocolate malt, and different chocolate malts have different characters. This is another malt that brewers should sample in a tea. For one thing, although the roasting profiles are similar, chocolate malt and actual chocolate taste distinctly different. There are some similarities, but chocolate malt really does not taste like roasted cacao nibs. (Roasted cacao nibs are what gives chocolate its flavor.) In addition to the fact that chocolate malt already covers a fairly wide range in color, there are pale chocolate malts, too (Fawcett Pale Chocolate Malt, for example, at 180–250 °L), as well as Briess’s Dark Chocolate Malt (420 °L). And finally, Juno Choi (for Brewers Supply Group) recently sent me a sample of Patagonia’s Perla Negra, a huskless dark malt kilned to 340 °L (in the vicinity of the chocolate malt range). I haven’t had a chance to brew with it, but it smells good. There are many other kinds of darkly roasted malts to explore. Some maltsters produce dehusked or debittered versions of their black malt. Weyermann, for example, offers dehusked versions of their Carafa malts. These malts all have the word “special” in their name. For example, Carafa Special III malt is the dehusked version of their Carafa III malt. For US homebrewers, debittered black malts by Dingemans and Briess are also available. These malts are still intensely roasted, but — as the name implies – less bitter than their “regular” counterparts. They also produce less astringency than comparable malts. A few maltsters also offer darkly-roasted wheat malts. Briess offers Midnight Wheat Malt (550 °L), and Weyermann has their Chocolate Wheat Malt (400 °L), in addition to their Chocolate Rye Malt (188–300 °L). 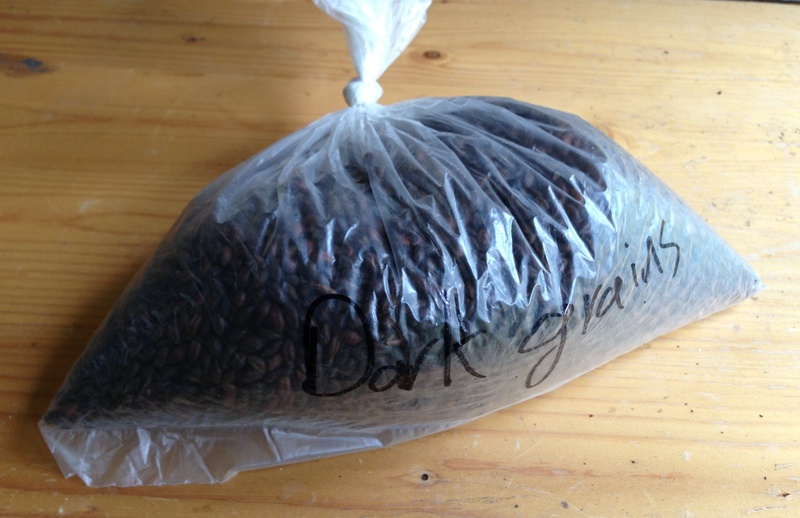 And occcasionally, you might be able to find a coffee malt, such as Franco Belges Kiln Coffee Malt (150–180 °L). In short, between roasted malted barley and roasted unmalted barley, husked and dehusked malts, roasted wheat and roasted rye, the entire range of chocolate malts, plus the “oddball” dark malts, you have plenty of dark grains to choose from when brewing a Russian imperial stout. When formulating your recipe, I would recommend choosing at least one malt (or grain) for its aroma properties. This could be roasted barley or a chocolate malt. Choose at least one other malt for its flavor — this could be black malt, roasted barley, chocolate malt, or any other darkly-roasted malt. I would also recommend that at least part of your grist come from a malt or grain roasted to 500 °L or higher. As an option, you could pick an unusual dark roasted malt to set your dark grain character apart from other similar beers. Then, you can adjust the beer color and color of your foam by adding black malt (either husked or dehusked). Russian imperial stouts are very big beers that you may age for years. As such, I would recommend buying small amounts of all the dark grains you’re considering and making a tea from each. A little ingredient research will go along way in this beer that that is already going to be expensive, and time-consuming, to brew. Finally, when some brewers hear about debittered black malt, they rush to adjust their recipes to use this “mellower” grain. I would recommend at least contemplating if the “harsher” aspects of black malt might actually benefit your beer. Just as a very hoppy IPA benefits from a little bit of a cohumulone “bite” — in my opinion, at least — I think extremely big stouts benefit from a little bit of “sharp” dark grain bitterness and astringency. This “rough edge” keeps the malt character from being too soft and polished. In particular, if you’re going to brew an aggressively hoppy version of this style, don’t round off all the edges of the malt profile. It should (more than) hold its own against the hops. Tomorrow, I’ll discuss the other grains in a Russian imperial stout and give a few examples of different grists and what to expect from them. I enjoy this article very much. I’m waiting for the next one. Thanks a lot for the article. I’m preparing a RIS recipe for a local competition and I’m doing a little bit of previous research. After reading your Porter and Imperial Stout articles, I’m a little bit confused about the impact tht black malt and roasted barley will have in the colour of the foam. In your Porter: II (Dark Grains) (October 14, 2013) you said “Roasted barley not only adds color and flavor to the beer, it will also darken the beer’s foam, something black malt or chocolate malt will not do.” . In this article you said “In addition, a dark beer that has roasted barley as the only dark grain will have cream-colored to light tan foam. A similar beer that has black malt as the only dark grain will have darker, reddish-tan foam. “. I think that you are right in this article and the roasted barley don’t colour the foam as much as the black malt does, but I’m not really sure. Please, could you clarify this point?